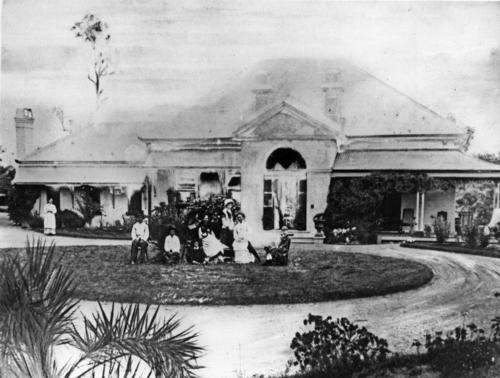 Ballymore House c1878: State Library of Qld Negative number: 153648 (no longer in copyright). This heritage house no longer exists and the land was subdivided. Buiding on yesterday’s post about using electoral rolls to determine your street’s population, I decided to enter the name and other data into a spreadsheet which could be sorted in different ways. Somewhat to my surprise I found that there is really only one family living in the street with continuous residence from World War I to the 21st century, and that is my own family. I suspect my grandfather bought the land in the 1912 subdivision of the estate and may have lived intermittently in the street before 1917. Another family has earlier roots in the street but subsequently moved post-1959 into the street parallel. From my own personal knowledge, another half-dozen or so families lived in the street for fifty or so years before moving to other areas, so the population has actually been more stable than the old electoral data suggests. While I can link some properties from earlier records with the numbered street addresses, this has not always been possible: oh for my father’s knowledge of the street. There are some complications with the data as the 1912 subdivision muddies the water given the introduction of new street names and the ambiguity over the use of the property name vs street name vs estate name. This is why the data only commences with the 1913 rolls although I can locate some people who worked for “Ballymore House” on earlier rolls, including my grandmother’s half-sister. Another very distinctive feature of the demographic is that for the vast majority of couples, the woman’s occupation was “domestic duties” or “home duties” suggesting the general income levels were such that the families could manage without a second wage. There are only a couple of examples where the woman has an outside occupation and they are living in the rented accommodation, suggesting perhaps they were saving for a home? And what of the residents’ occupational classifications? Well I found the street was more diverse than I anticipated. Given the gentrification in the area in recent decades due to its proximity to the city, death of older residents and relocation to other suburbs, the occupational analysis now would be very different from this one, based on the older electoral rolls. If you are interested in learning more about the street or neighbourhood where you grew up you might find this an interesting exercise to try out. Of course if you come from a long street or a road it might not be so much fun! This entry was posted in Brisbane, Local History, Queensland, Queensland and tagged Ballymore House, electoral rolls by cassmob. Bookmark the permalink.